1：Please connect the device to the direct USB port on your computer. ?If you connect it to a USB hub or extension cords, it maybe cannot recognize the Driver or read the CD/DVD. 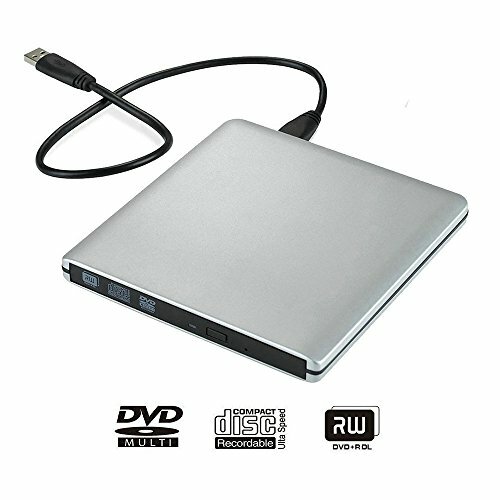 【Using Advanced USB3.0 Technology】：This DVD-RW drive provides you high speed data transfer (The USB 3.0 transfer is 10X speed of USB 2.0，which ups to a maximum of 5Gbps) . Detachable USB cable and the Eject design; Never worry about the disc stuck inside. 【HIGH COMPATIBILITY】：The item is compatible with Windows 10 / 8 / 7 / 98 / SE / ME / 2000 / XP / Vista , all Version MAC OS system. 【Materials and Highlights】：The pure copper mesh technology, it Made by premium wire drawing material enable the cable low impedance and anti-interference ability, low noise, anti-interference and high durability. thus brings more stable data transmission.